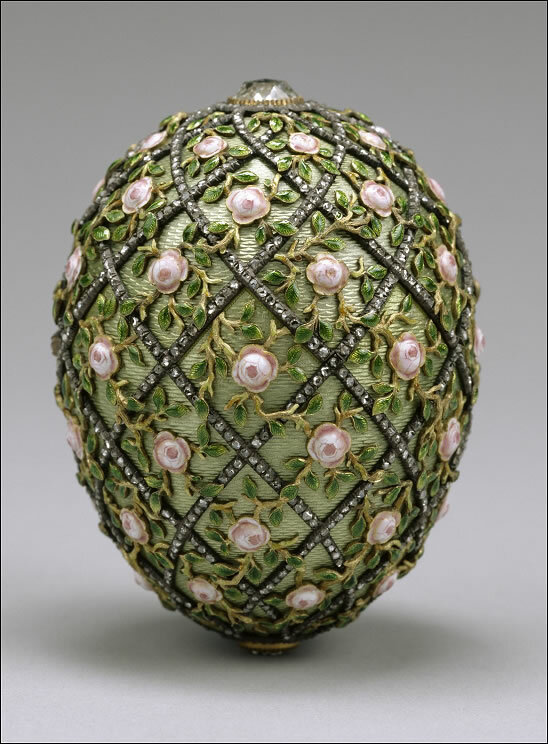 The 1907 Rose Trellis Egg is made of gold, green and pink enamel in various shades, portrait diamonds, rose-cut diamonds and satin lining. Possibly the missing surprise was a chain, made of diamonds and watercolor on ivory. 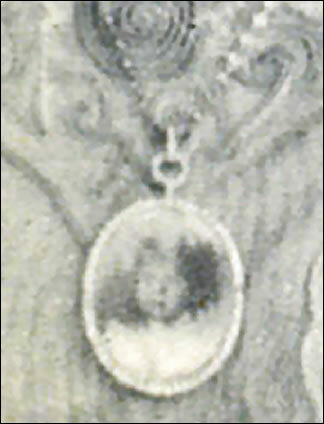 Fabergé's bill provides the following description of the surprise, now lost: "a chain of brilliants with a medallion holding a miniature of His Imperial Highness, the Grand Duke and Heir, Czarevich Alexei Nicolaievich...". Further research indicated the portrait of the Heir was painted on Ivory. (Von Habsburg, Lopato, Fabergé: Imperial Jeweller, 1993). 1907 was one of the few years that the Egg for the Dowager Empress Maria cost more than the gift for Tsarina Alexandra. The other times this happened were: in 1896 the Alexander Monogram Egg, cost more than the Rosebud Egg, in 1910 Alexander III Equestrian Egg cost more than the Colonnade Egg, and in 1913 when the Winter Egg cost more than the Romanov Tercentenary Egg. 1920 owned by Alexander Polovtsov a former employee at the Gatchina Palace who started an antique shop in Paris. It is not known how Mr. Polovtsov acquired the Egg. In 1930, together with Maria Feodorovna's 1901 Gatchina Palace Egg, sold to agents of Henry Walters, Baltimore, Maryland, USA. In 1936 exhibited in the Walters Art Gallery, Baltimore. 1952 On permanent exhibition in the Walters Art Gallery, Baltimore, Maryland, USA. All images on this page, courtesy The Walters Art Museum. Update October 2017. Corrected the description of the surprise. Snowman's 1979 said oval locket but the on the (Russian) invoice it is called a medallion. This correction is important because I think that the surprise belonging to this Egg has been identified. Read all about this discovery on his page! See also Forum Photos for this Egg on view in San Francisco 2009!